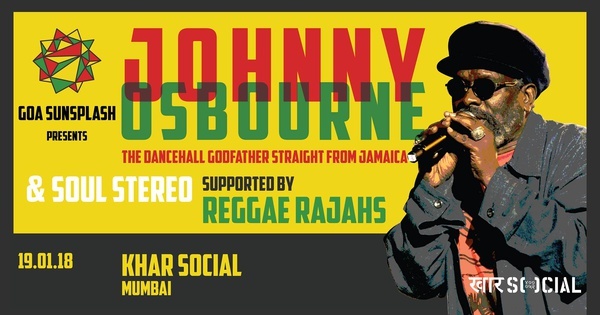 Jan. 19, 2018 at 9 p.m. to Jan. 20, 2018 at 1:30 a.m.
Fresh off a historical India debut at Goa Sunsplash 2018, Johnny Osbourne, the reggae icon from Jamaica will be live and direct in Mumbai on Friday, 19th January. He will be supported by Soul Stereo, one of the most important sound systems from France. Reggae Rajahs will be playing an opening set to get the party started. Johnny Osbourne (born Errol Osbourne, 1947) is a popular Jamaican reggae and dancehall singer, who rose to success in the late 1970s and mid-1980s. His album Truths and Rights was a notable roots reggae success, and featured "Jah Promise" and the album's title track, "Truths and Rights". However, he is probably best known for his mid-1980s dancehall reggae hits "Buddy Bye" (based on King Jammy's Sleng Teng riddim), "Ice Cream Love" and "Water Pumping". The hits continued with "Get Cracking", "Check For You", "Rewind" (1984), "Buddy Bye", "No Sound Like We" and "In The Area" (1985). In the late 1980s he was particularly successful when recording for Bobby Digital, and had hits with "Good Time Rock" (1988) and "Rude Boy Skank" (1988), both of which are included on his 1989 album, Rougher Than Them. Throughout the 1980s he continued to record for Coxsone Dodd, and singles included "Keep That Light", "Unity" and "A We Run Things", but a long-promised second album from Dodd has not materialized. After having worked as reggae specialists at the notorious Patate records shop in Paris, the early core of Soul Stereo, Jamaican music buffs Fatta and Reecko, decided to take the next step and start their own sound system in 1998. Following the success of that early gig at le Divan du Monde, they'd go on and fill up all of France's capital best clubs for the years to come as the resident DJs and selectors. They have since gone on the road and have played no less than 1,500 shows all over France and Europe: Italy, Switzerland, Germany, Israel, Scandinavia, you name it. Earning along the way such a reputation of excellence that many artists have trodded along and grabbed the mic for Soul Stereo -the most famous include Junior Kelly, Luciano, Mikey General, Morgan Heritage, Lone Ranger, King Kong, John Wayne, Reggie Stepper, U Brown, Max Romeo, Rod Taylor, Earl Sixteen, Dennis Al Capone, Frankie Paul, Tony Roots, Nerius Joseph, Lyricson and many local artists. Reggae Rajahs have opened for Snoop Dogg and Major Lazer and have also shared the stage with a number of established international artists. They have toured across Europe, South America and South East Asia in recent years. They host an international reggae festival every year called Goa Reggae Sunsplash, and are also key part of the hand built 10,000 Lions Sound System, one of two Jamaican style speaker systems in India.